The Brewer And The Saloonkeeper. The corner saloon has always been an absolutely essential ingredient in the makeup of the brewing industry. Virtually the sole outlet for beer throughout the nineteenth and early twentieth centuries, the saloon was, simply stated, the brewer's lifeblood. Beer, after all, was first and foremost an imbibery of the saloon, and only secondarily a household product. But even so, right up until the onset of prohibition, the "take-home" trade, as well, was conducted through the saloons. 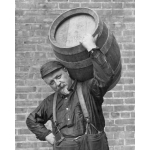 "Growlers" -- small tin pails used exclusively for carrying beer from saloons -- were a significant portion of the typical saloonkeeper's business in the early days. Later, the ease and convenience of bottled beer doomed the growler to extinction, but even bottled beer was dispensed primarily through saloons. It was not until after the repeal of prohibition in 1933 that new retail channels for beer began to develop. As America's mobility increased, particularly after World War II, so too did "off-premises" consumption of beer. But for more than a century prior, it was entirely the neighborhood drinking establishment through which brewers built their trade and amassed their fortunes. As competition within the brewing industry intensified during the last two decades of the nineteenth century, overt control of the saloon trade became a powerful weapon in the brewers' arsenal. The strategy was to lock out competitive brands of beer by eliciting exclusivity agreements from saloonkeepers. Whereas in the old days the brewery "collector," as he was known, often did little more than take and fill the saloonkeeper's beer order, there was now in his stead a bona fide salesman, pressure tactics and all. The brewery man often came into a prospective customer's saloon bearing all sorts of gratuities such as complimentary glassware and serving trays, lettered for the brewery, of course. Large wall hangings, providing an appealing decoration and advertising the brewery at the same time, were popular giveaways. Buying rounds of beer for the entire place was common. But once all of the obligatory pleasantries had been tendered, it was usually simple price competition that sealed the deal. The saloonkeeper would be offered a price slightly lower than the going rate in exchange for his promise to sell only the beer of the sponsoring brewery. However, there was no easy recourse for the brewer in the event that the saloonkeeper decided (as many certainly did) to break his commitment and seek a better price from a rival brewery. This inevitably lead to bitter price wars, often so damaging that the brewers themselves were forced to call a truce. Breweries in many cities set up local trade associations for the expressed purpose of establishing and enforcing strict guidelines regarding the pricing of beer, thus avoiding the sting of heated price battles. A much more effective method of saloon control concerned the buying and selling of saloon fixtures by brewers. The many necessities in setting up a saloon -- the bar, the backbar, tables, chairs, beer-tapping apparatus, and a myriad of other utensils -- represented a large investment for the prospective saloonkeeper. For those unable to secure financing, the startup costs were nothing short of prohibitive. This, of course, is where the brewer came in, offering to supply the necessary fixtures on credit, often on an interest-free basis. The brewer required only that the saloonkeeper agree to sell the brewer's beer, and only his beer, throughout the duration of the debt repayment. Naturally, such arrangements could involve a number of years, thereby securing a long-term captive customer for the brewer. One impetus for brewery control of the saloon trade originated from an unlikely source: the temperance factions. Among the favored tactics of the anti-saloon groups was to campaign for disproportionately high license fees for saloons. The rationale was that by making the license unusually expensive, the "grog shops" -- that is, those establishments where lewd and drunken behavior ran wild -- would not be able to afford the fee, and would thus disappear. City and state governments subscribed to the idea in astonishing numbers, objecting neither to the notion of eliminating the troublesome saloons, nor to the prospect of boosting revenues from the respectable ones. But, of course, the concept was flawed from the beginning. Brewers would not sit idly by and watch their outlets be knocked off one by one. Instead, the brewers stepped in and paid the high license fees for those saloons which they deemed important to their trade. Again, the only string attached was that the saloonkeeper became an exclusive customer of that particular brewer. So, the net result of the high license fee was to strengthen the brewers' hold over the retail business. But the ultimate control of a given saloon meant simply owning that saloon. And brewers were large holders of saloon properties. By 1909, the brewing industry as a whole was said to have invested about $70 million in the purchase of retail drinking establishments. One historian estimated that during the years before prohibition, brewers controlled as much as 85 percent of the saloons in America. Even in cases of brewery-ownership, though, the saloon was usually run by an independent entrepreneur. The prices of beer were fixed by agreement with the brewery and the monthly lease payment was partially worked-off through the saloonkeeper's beer purchases. Naturally, selling competitive brands of beer on the premises was strictly disallowed. By the time prohibition was enacted, most brewers had accumulated an enormous number of saloons, often in the hundreds. This, in turn, lead many to go into real estate once brewing became illegal. Indeed, in their quest to gain control over the retail trade, brewers had inadvertently become bona fide experts in the valuation, purchase, management, leasing and sale of real estate. And, of course, the former saloon properties could be reconditioned for other uses and leased to new tenants. Indeed, of those brewers who managed to maintain their fortunes well into the dry years, most accomplished it through the business of real estate. After the repeal of prohibition in 1933, brewers faced a very different scenario as concerned the sale and distribution of beer. Government regulation prohibited brewery control of all retail channels. While even today the corner tavern remains a vital part of the brewer's livelihood, the days of the old-fashioned brewery saloon are gone forever. Copyright 1998 Carl H. Miller.